Looking for a great winter adventure? How about trying to snowkite in Utah at Skyline? It’s one of Laurel’s favorite destinations in the world! What makes snowkiting Skyline Utah so special? Glad you asked! Read below and watch Laurel’s Snowkiting 101 video on our YouTube Channel. 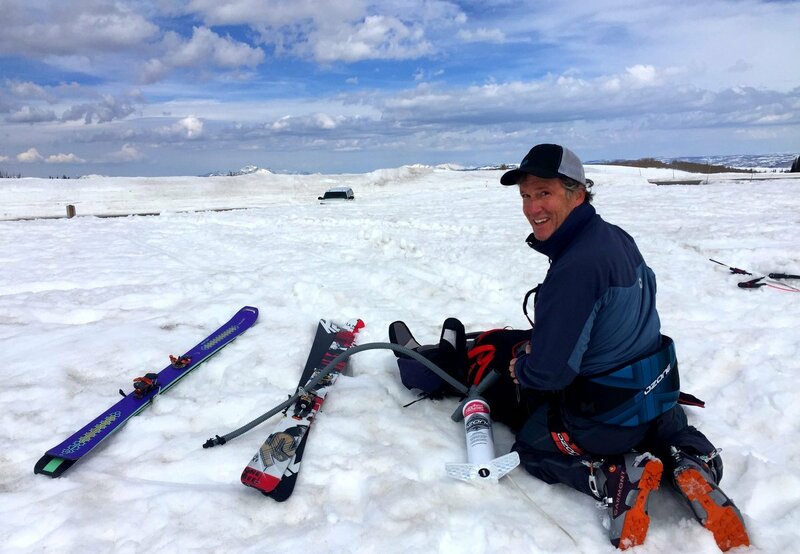 The terrain to snowkite Utah’s Skyline Drive is accessible for all levels. It starts with a wide-open area with few trees to get in the way. First-time snowkiters will find flats right off the parking lot, intermediates and advanced riders can play on the two hills on either side of the parking lot. Stay away from the gulley in the center of the two hills. The snow can be deep and fluffy in winter and soft and forgiving in spring. It’s also very high, close to 10,000 feet above sea level. Stay hydrated, eat frequently, and take it easy. Get your gear together, gas up your 4WD vehicle and head out of the hustle and bustle of Salt Lake and Park City, untracked powder and no crowds awaits you! We pack full backcountry ski gear: alpine touring skis/binding/boots, and avalanche beacons. In our packs we always have our avalanche probe and shovel, first aid/repairs/survival kit, extra layers, headlamp, water and collapsible ski poles. For snowkiting we use the same kites as on the water. Bring your biggest kites, we’re usually on the 15m. Getting the kites ready to fly! As you’re two hours south of Salt Lake City it’s worth checking out the Skyline Motel at the base of the mountain in Fairview Utah. It’s no frills but friendly and comfortable and only $67 per night. It’s across the street from two good diner style restaurants: Home Plate Cafe and T-Cee’s Dari Frez (yes that is the real name). There’s a burger style place in the gas station on the north side of the road leading up to Skyline, and the gas station on the south side has breakfast bowls to go. Fairview is pretty limited, however 7 miles south is Mt Pleasant where you’ll find more hotels, a Mexican restaurant, a liquor/wine/craft beer store, some Airbnb’s, the pharmacy and little hospital. Fly to Salt Lake City airport (SLC) and rent a good 4WD vehicle, or drive yourselves and make sure you have either 4WD or snow tires. You can also rent an RV for extra comfort when hanging out in the parking lot. There’s a little road skiing place just before you reach Skyline, if its a weekend there will be a bunch of local kids charging on this. Exploring the backcountry is fun on a no wind but clear day. If there is a big storm we usually head back up to the resorts: Alta (if we want to brave the crowds), Deer Valley to ski with Pete’s uncle Mike O’Malley (he’s a weekend mountain host), or all the way up north to Powder Mountain. Strawberry is the second most popular snowkiting location in Utah. I’ve only had one day at Strawberry, it was honking stormy and pretty icy. I’ve not been back since, however I’m sure I’m missing something. One day I’ll branch out and get back to Strawberry! When we’re in this area we usually mission, and drive all the way up to Jackson WY/Teton Valley ID to explore those fantastic snowkiting locations. And if we’re really lucky we have time to make it all the way up to Montana too! Snowkiting is a fabulous way to bridge your passion for kiting with a love for the mountains. Leaving the lift lines behind and exploring frozen nature is totally worth it. People always ask us about the cold. Yes, it’s cold, but you dress for it, learn some tricks (like leaving your lines attached to the kite) and once you’re snowkiting you warm up quickly. With no chairlift rides to cool you off, and fresh powder all around the cold will be the last thing on your mind. Did we convince you? Hope so! Here’s some additional resources to help make your trip to snowkite Utah Skyline easy and fun. 1. Bring a decent quiver of kites, I would bring a 9, 12, and 17 LEI. However, if you can only bring one kite bring your largest kite. If you ask most of the Utah locals, they will tell you that they use a 17m kite more than all of their other kites combined. The wind tends to be light and the snow tends to be deep, so you need all of the power you can get. 2. Talk to a local about the wind, terrain, wind shadows. Kiting in the mountains has a higher learning curve than snowkiting on a frozen lake. A lot of newbies and people from out of town end up getting stuck in wind shadows. I have seen it happen to pros. It only takes a few minutes to introduce yourself to a local and to find out where the pitfalls lie. 3. 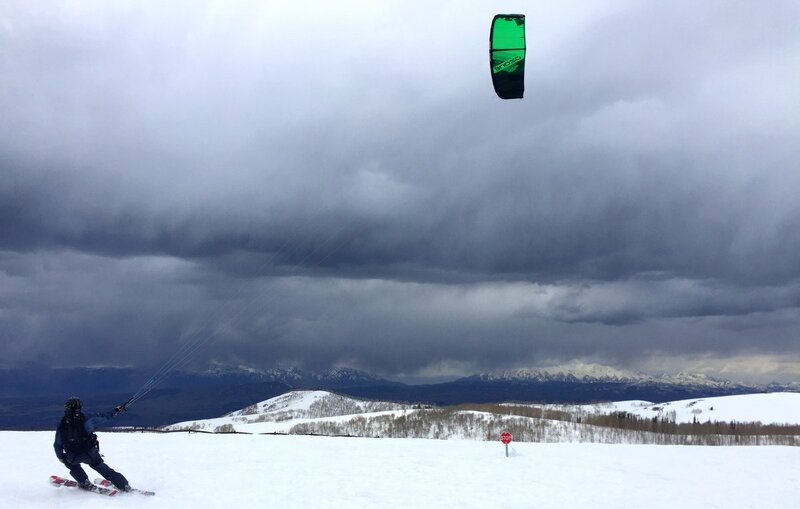 Kiting at elevation requires a high level of physical fitness. Skyline and PowMow are over 9000 feet. The air is thinner up there and the snow is often deep. Prepare yourself several months ahead for a vigorous effort. 4. Prepare yourself for the altitude. Get plenty of sleep. Hydrate well, move slowly at first to allow your body to adapt. 5. Come prepared with a backup plan. Sometimes a high pressure ridge will park over the area and shut down the wind. Those days are good for resort skiing, cross-country skiing, snow shoeing, etc. Liked this Travel Guide by not convinced by COLD?